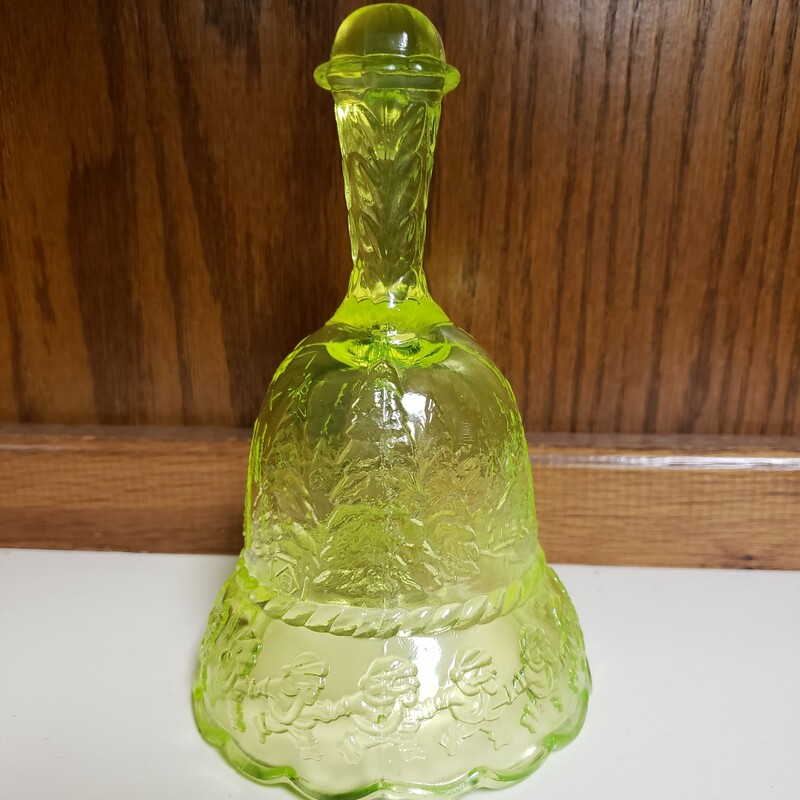 Dancing Santas Vaseline Glass Christmas Bell, Bargain Shack offers Boyd Glass, Mosser Glass, L.G. Wright, and Contemporary Collectible Glass including Vaseline Glass - J.B. Scottie Dogs, Pooche, Animal Covered Nests, Toothpick Holders, Salts, Glass Animal Figurines, Clowns, Dolls, Slippers, Vehicles, and More! Just in time for Christmas! This is a beautiful Dancing Santa Christmas Bell in vaseline from Boyd Glass. Just beneath the handle is a church surrounded by snowy pines and a two horse sleigh travelling through the woods. The bottom edge is decorated with jolly dancing Santas. Standing 6" tall and made from pure yellow vaseline glass it glows like a firefly under a blacklight too! I only have one in stock, so you better hurry and order this one before it's gone.